Visit the Violin Bow Technique website for a comprehensive view of Fintan’s approach to learning violin, and the Violin Technique Blog for regular updates. Fintan Murphy is a performer, teacher and string pedagogue. Born in Melbourne, Fintan completed further study in Cologne with Helfried Fister, Christoph Poppen and the Amadeus quartet. He completed his Masters degree with Robert Gerle in Washington, D.C. Fintan was a member of the Melbourne Symphony for many years and now performs in concerto, recital and chamber music, collaborating with artists such as Goetz Richter, Stan Dodds, Elizabeth Sellars, Hartmut Lindemann, David Bollard, Ben Martin, David Selig, Janis Laurs, Christian Wojtowicz, Kees Boersma. Fintan directs the Melbourne String Ensemble, a youth orchestra specializing in small ensemble repertoire and chamber music for strings. He has worked as a guest conductor for many youth orchestras including: the Conservatorio de Musica de Manresa, the Escola Superior de Música de Lisboa and Junges Kammerorchester Stuttgart. Fintan is a leader in the development of teacher training and instrument specific pedagogy both inside and outside the university system. 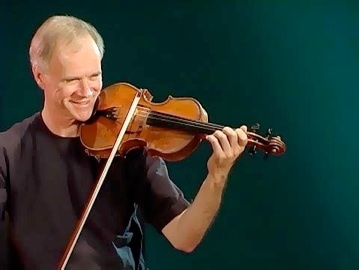 Since 1994 he has developed and taught string pedagogy courses to undergraduate and graduate students at the University of Melbourne, Monash University and currently at the Sydney Conservatorium of Music. He has supervised numerous post-graduate doctoral and masters students and presented over 350 seminars, summer schools workshops and conference presentations throughout Australia, the Asia-Pacific, Europe and the North America. Fintan believes that students need to actively engage in the lesson if they are to make continual long term progress. His teaching practice leads students to ask questions so that they can learn how to teach themselves. It is important that they develop an understanding how the principles of playing relate to their own stage of development, to their own physique and their own motivations and goals. The results of Fintan’s research are presented on the Violin Bow Technique website, on DVD and in text. His work with Skype as a teaching tool and experience giving masterclasses and seminars including in relatively remote parts of Australia and the Asia-Pacific, led to the publishing of 20 CD and DVD recordings. These recordings include Violin Bow Technique, Violin Left Hand, the Violin Alive series, Bridges, and The Soul of the Viola and have received glowing review in journals such the Strad and the American string teacher. Fintan sees the importance of working with disciplines such as psychology, drama as well as sports training in order to develop rounded musicians who have healthy and satisfying careers. His collaborations with psychologists, health scientists, body use professionals have led him to publish peer reviewed articles in the journals such as the British, the Australian and the International Journals of Music Education. Fintan has edited eight books of graded violin repertoire for the Australian Music Examinations Board (series 7) and he has won many competitive grants including an Australian Research Council linkage grant. Fintan is the joint editor of the string journal String Praxis and is the Chair of the Specialist Examining Panel for Strings for the Australian Music Examination Board. Fintan currently teaches violin and string pedagogy at the Victorian College of the Arts Secondary School and the Sydney Conservatorium of Music.